Cars, people, building work and everyday life can all lead to the soil around a tree becoming compacted, starving the tree’s roots of oxygen and nutrients. Decompaction is the process of skilfully injecting compressed air into the soil around a tree’s roots, making it more permeable allowing air, water and nutrients to be taken up by the tree’s root system. This in turn boost’s the trees natural health and resistance to pests and disease, prolonging its life. Ringrose Tree Services has been decompacting trees since 2001, making us the leading experts in the UK. We use both AirSpadeTM and our own TreeSaver decompaction machines. We have successfully nursed many veteran trees back to health in private grounds, on busy streets and where building work has been carried out. Our video shows Ringrose Tree Services at work using the AirSpadeTM to decompact the soil around a tree. 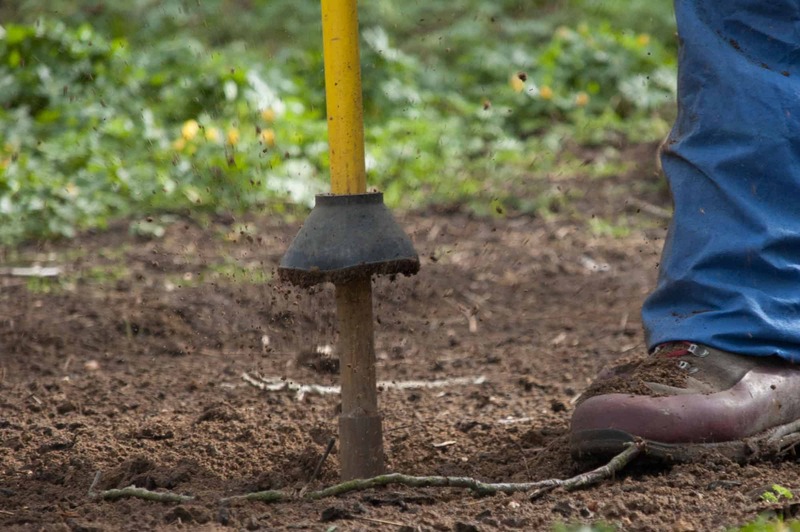 Highly effective and non-invasive, the AirSpade is a pneumatic tool that uses compressed air to selectively remove soil directly beneath a tree, greatly reducing the risk of injury to the roots (unlike a spade which can cut through the roots). This allows root collar investigations (mapping the area where a tree’s roots meet the trunk) to determine the health of the roots and any areas of decay. If the health of a tree is suspect, we can elect to use this tool to investigate the health of the roots. We recommend a root-nourishing layer of mulch after decompaction. A high-tech combined system that decompacts, aerates, improves drainage, and if required, simultaneously feeds the soil around a tree’s root system. A step on from the highly-respected Terravent, our own TreeSaver machine uses a high-powered jet of compressed air to decompact and feed the soil with a mycorrhiza fungi-enriched plant food. Re-establishing the symbiotic relationship between the roots and soil, via the introduction of mycorrhiza, forms a health-boosting barrier around the root system that supports its natural resistance to disease. The Royal Botanic Gardens, Kew, use this combination of decompaction with mycorrhiza feed to preserve their mature trees. A tree’s perfect situation is an established woodland, growing in soil enriched with a group of fungi called mycorrhiza. Mycorrhizal fungi are a remarkable and extremely important group of organisms that live symbiotically with plants, effectively extending the root area of plants, enabling the roots to better absorb nutrients and water. If the natural balance of mycorrhiza is upset, perhaps by building work or other soil compaction, the absorption and efficacy of the mycorrhiza can be dramatically reduced, which in turn can reduce the plant’s health and resistance to disease. We use our own Tree Saver system to inject mycorrhiza into the soil using a high-powered jet of compressed air, which simultaneously decompacts and feeds the soil around the root area. This method of soil decompaction with mycorrhiza feed is being used at The Royal Botanic Gardens, Kew, to care for their trees.